She is believed to have sewn one of the first flags for our country. An Indian girl, from the Powhatan tribe in Virginia, who was a helper and friend to the settlers in Jamestown. Born in Virginia. A farmer, then brave general who led the fight for freedom against England. Washington became the first President of our new nation. He helped set up our new Republican form of government and put the basic principles into practice. He is known as “Father of our Country”. Christopher Columbus – 1492 – sponsored by Spain (though he was born in Italy). He wanted to find a new route to the East Indies (islands in Asia, not India). When he landed on the island of San Salvador in the Bahamas, he thought he had reached Asia. 3rd President – born in Virginia – Wrote the Declaration of Independence, which called for independence from England. It also states that people have certain rights, like the rights to life, liberty and the pursuit of happiness. Sponsored by Spain. He wanted to discover riches and gold, and new land for Spain to conquer. He landed in Florida, near St. Augustine, and claimed land in Florida for Spain. An African American who studied science and plants. He became a teacher. He developed hundreds of uses for peanuts, sweet potatoes and soybeans. She led the struggle to give women equal rights, including the right to vote. Sponsored by England – He wanted to establish a colony for England in Virginia. He also hope to find gold and other riches. 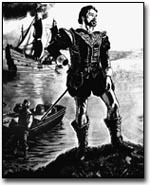 He arrived in Jamestown, Virginia in 1607, and started a settlement there. This was the first permanent English settlement in the New World. African American woman who refused to give up her seat on a public bus to a white person. She helped bring about changes in these unfair laws, and worked hard so that all people would have equal rights. An African American minister who worked for equal rights for all people. He helped bring about changes in unfair laws through peaceful means. He led peaceful marches and gave many speeches calling for equality of the races. In one famous speech, he said, “I have a dream…” that one day black and white boys and girls can walk hand in hand. Sponsored by France – He wanted to set up a French colony. He landed near Quebec, Canada and explored around the St. Lawrence River Valley. Parts of Canada belonged to France for a long time, and many Canadians still speak French. African American major league baseball player. The first African American justice on the Supreme Court.